The Takata airbag recall, begun back in November 2014, continues to expand. According to Consumer Reports, the National Highway Traffic Safety Administration (NHTSA) has called it “the largest and most complex safety recall in U.S. history.” The recall was expanded in May 2016, and a new report out of the Senate Commerce Committee says that new vehicles using the defective airbags continue to be sold. This means that more drivers and their families could face injuries or even death from these defective products. The recall involves airbags produced by Japanese auto parts supplier Takata and contained in vehicles produced by 14 different automakers, including Audi, BMW, Honda, Toyota, Ford, General Motors, Fiat Chrysler and Volkswagen. Affected vehicles were primarily produced between model years 2002 and 2015, with more than 100 million vehicles involved. The airbags at issue (usually driver’s and passenger’s side front airbags) have a defective inflator. This defective inflator can lead the airbag to deploy explosively, sometimes even in minor crashes. 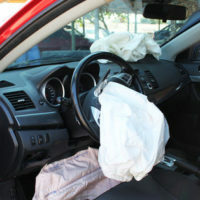 In some cases, the airbag explosion sent shrapnel into a car’s passenger compartment. Thus far there have been 10 fatalities and more than 100 injuries caused by defective airbags in the U.S. The tenth victim, a 17-year-old girl from Texas, was killed by shrapnel hitting her neck. Since the recall began, it has tripled in size as more vehicles have been found to be affected. Most recently, in May 2016, NHTSA expanded the recall to include an additional 35-40 million airbag inflators. As of that time, NHTSA showed that 8,168,860 airbags had been replaced. Despite the massive size of the recall, Consumer Reports points out that deaths and injuries caused by the defective airbags are rare. Indeed, the Department of Transportation estimates that front airbags generally have saved 37,000 lives between 1987 and 2012. Every year tens of thousands of consumers suffer injuries caused by defective products – sometimes the very products meant to protect them, as is the case with airbags. Some manufacturers (like those who continue to include defective airbags in their cars) seem to elevate profits over safety. If you or your family has been harmed by a defective product, the skilled product liability lawyers at Lesser, Lesser, Landy & Smith, PLLC, can work to help you obtain justice. Contact us about your case today.